The IX Series 2 offers the power of an Enterprise platform with the simplicity of a single system. Register any IX Series 2 station to Cisco Unified Call Manager® and place or forward calls to an external phone number. Learn the best practices, current technologies, and the policies and procedures required to handle a variety of security challenges. 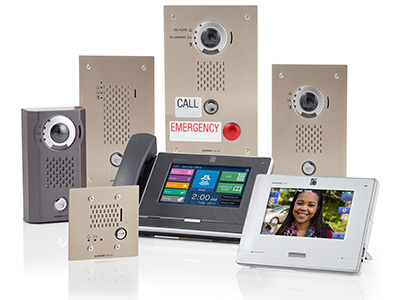 Redefining what one IP system can do, our new IX Series 2 Peer-to-Peer Video Intercom solution with SIP capability offers the power of an Enterprise platform with the simplicity of a single system. Our Technical Support Team has created a new online FAQ for our most popular products based on our most frequently asked questions. Click here to take a look! Learn how the new IX Series 2 redefines what one IP Series can do! Take control of your front door with the JO Series video intercom from Aiphone. It lets you see and talk with visitors and remotely unlock the door whether you’re in the kitchen or on vacation. Watch the Fox News 5 news story about the National Student Safety & Security Conference featuring Aiphone’s new IX Series 2 IP Peer-to-Peer Video Intercom . Your number one concern is ensuring the health and well-being of patients and staff – in all its forms. We offer security solutions for pharmaceutical and records rooms (HIPPA compliance), nurse call, communication in parking areas, visitor and staff entries, and pediatric security. Partner with us to implement solutions throughout your healthcare campus. Select an Aiphone system based on your specific security needs. Watch a brief video of our solutions for healthcare facilities. Talk in real time with a member of our Technical Support department. 2019 Aiphone Corporation. All Rights Reserved. Tell us about yourself, and we'll be in touch right away.